The Peli 9600 offers a powerful output to illuminate long stretches of roads, tracks and backstage areas without the hassles of conventional heavyweight lighting towers. At least twice as efficient as fluorescent alternatives, the Peli 9600 can provide double the distance of illuminated work area from the same model of generator. Engineered with side and end bracket attachment points, plus a stand system that can extend up to 3 metres, the Peli™ 9600 Modular Light can be mounted to fences, hang overhead or stand on its own. It also features an inter-locking stacking system with a small footprint, keeping multiple units safe and secure in transit or storage. The optimised elliptical beam pattern is designed to provide as much lateral illumination as possible, and each light bar features a user-adjustable tilt mechanism, to focus light accurately and eliminate dangerous dark spots in the work site. Built with tough Polycarbonate recessed lenses and internal shock supports, the Peli™ 9600 Modular Light features a durable waterproof design and is built to survive rough terrain, adverse weather and inevitable drops. 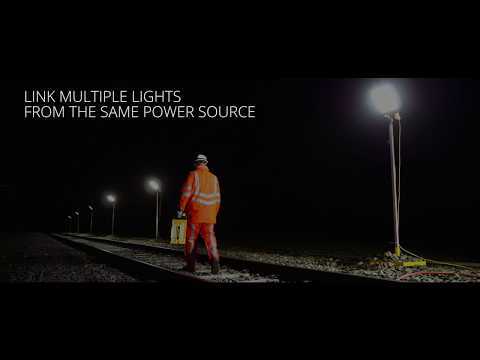 The Peli Area Lighting range provides portable, powerful LED light for work areas where there is no mains power. Ideal for maintenance, these units are compact to transport and can be set up quickly and easily.